IWC Big Pilot's Watch Perpetual Calendar Edition "Le Petit Prince"
The new IWC Big Pilot's Watch Perpetual Calendar Edition "Le Petit Prince" is the first in the collection to feature a classic moon phase, one which pays an exquisite tribute to Antoine de Saint-Exupéry's novella. 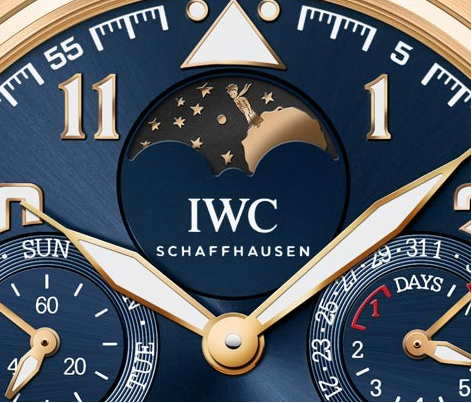 For this edition, IWC have recreated to stunning effect a scene which many will remember from their childhood, and one which will cause many to reflect on its thought-provoking quality. Just below the 12 o'clock, through a crescent-shaped aperture the dear little fellow can be glimpsed standing on his own planet, a golden silhouette against the starry night sky - a poignant and charming panorama. The inclusion of "Le Petit Prince" does characterise this piece, but this is also an edition which is packed with a wealth of meritorious features. Inside is the IWC manufactured 51613 Calibre with its in-built Pellaton automatic winding system which creates a power reserve of 7 days, handily displayed at 3 0'clock. Also neatly laid out are the date, day, month and the year indicated using four digits. Even with such a wealth of indications there is still plenty of rich blue dial to be enjoyed - and although the cockpit styling which makes the Big Pilot's collection so desirable is still there, its sharpness becomes diluted in this sublime midnight blue/red gold combination. 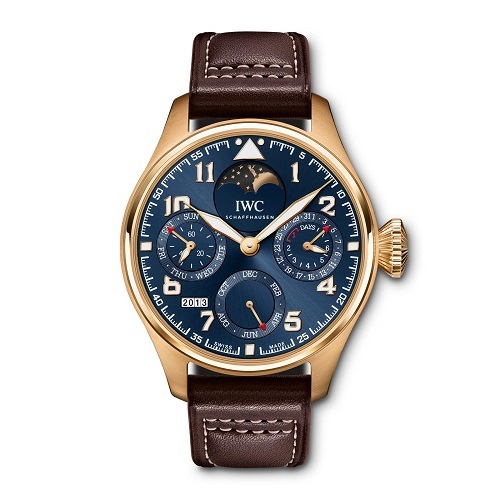 This IWC Big Pilot's Watch Perpetual Calendar Edition "Le Petit Prince" will be limited to 270 pieces. More information at IWC and more IWC in our extensive archives. The A.W.E. (-Inspiring) Thingamabob From Laikingland. It's Nomos - But Not As We Know It...... The Nomos Lambda and Nomos Lux.